After watching Philip Bloom’s DVD Learn 2 Shoot Great Video on Canon 7D, I was inspired to try a time-lapse video. I thought I would share some tips based on my experience shooting Times Square Pop. 1. Shoot JPGs to save time. I know … blah, blah, blah, I only shoot Raw. Well, think about this. A Canon 7D Raw files is 5184×3456 pixels but the Full HD Video image is only 1920×1080 pixels. That means the HD video image is only 12% of the Raw image size. Do you really think someone will tell the difference? If you have the extra time to convert Raw files and then downsize them, go for it. But remember, it takes 24 frames for 1 second of video and 1440 frames for just 1-minute of video. 2. Use Canon’s TC-80N3 to automatically shoot interval frames. 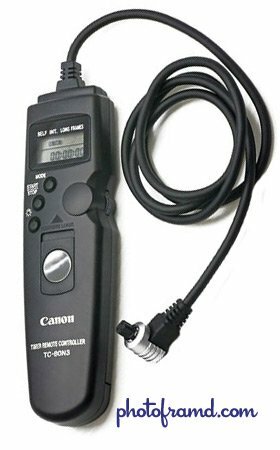 Canon’s TC-80N3 is a wired remote which will trigger the shutter based on its programmed settings. If you have used it before, be warned that it operates a little differently with the Canon 7D. Set the the Interval Mode to the desired time-lapse. For example, for street scene, use 2 seconds. For night sky photo, set the interval to at least 30 seconds. Remember that the shutter speed must be faster than your interval. Set the Counter to 00 for unlimited photos. Use only the start/stop button to control the photo capture. Do not use the Shutter Release button and lock. It will disable the start/stop function when used with the Canon 7D. 3. Plan your scene to include a mix of stationary objects and moving subjects. Buildings and trees give the video a consistent reference point while the cars and people move about. If everything is moving, the video will be too distracting to watch. 4. Slow moving objects can be great subjects to animate. Cars stuck in traffic suddenly come to life in a time-lapse sequence. LED signs and even big screen displays also work well. 5. Composition Rules apply to video too. Even though you are shooting video, you cannot forget all your experience as a photographer. Try to plan your composition, but remember the public at large has free will. There is something about using a tripod with a large lens and microphone that brings-out every Idol-wanna-be. Check back tomorrow for Tips on Converting the Image Sequence. NOTE – There are now alternate Interval Remote Timers for the Canon 7D! See my article on Time Lapse Video & the Interval Timer Remote. hello i wonder how to do a time lapse with out the controller just with the 7d does it have a way to set the camera to do shoot a pic every 2 seconds >? or any time posible please let me know thank u ! You can time it yourself by using a wired remote (around $20) with the camera mounted on a sturdy tripod. The remote will reduce vibrations from pushing the shutter (alignment is very important). You will just need to get into a rhythm. Play a very long song on your iPod. Remember … it takes 1440 frames to make 1-minute of video at 24 fps. At 2-second intervals, 1440 frames is a shooting time of 48 minutes! I have been reading the manual of my new canon 7D, and I cannot find the option to set the camera to shoot time lapse in photo mode, can someone please point me on how to set the camera without the remote control to do this, lets say Time Lapse mode and so I can choose the time interval of the pictures.. The option is not in the Canon 7D. In fact, I don’t think any SLR has that option built into it. You can create time lapse photos with any Canon DSLR using the TC-80N3 Timer Remote Controller. It’s actually a wired remote shutter release with the ability to automatically schedule the time interval between photos. If you do not want to buy this remote, you could try doing it manually. But, keep in mind … at 24 frames per second, you will need 1440 photos just for 1-minute of video! That’s a lot of photos! If you were shooting a sunrise what exposure would you use? Wouldn’t the change in light mess up the final exposure. Trying to shoot a 6:30 am balloon rally. Do you have a ND filter? If not, be sure to use a polarizer. Sunrise is a very intense light which can blow-out most details. A ND filter or polarizer will help cut the intensity of the light. Also, use a small aperture to bring in as much detail as possible. I would shoot in AV mode with a aperture between f/8 and f/16 and let the 7D set the shutter speed. Manually set the ISO for either 100 or 200 unless it is very cloudy or overcast. Balloons move fairly slow so the shutter speed should not be a problem. Concentrate on getting detail and check your photos as you go (just in case you need to adjust your settings). Are you shooting a time-lapse series? If so, make the interval setting for 1-second. Remember that you will need 24 frames for one second of video. I would also recommend shooting JPG to save time in post. Thanks all I have is a 4gb flash card, will this be large enough if I’m shooting a frame a second? If you can not get another CompactFlash card, you would probably want to shoot with one of the smaller JPGs. For example, the Small JPG is 2,592 x 1,728 pixels and about half the file size. HD Video is only 1920 x 1080 pixels, so the files would still be big enough for HD. However, if you really like a photo and want to use it for print purposes, the 4.5 megapixel image might be small for a large print. Note also that you want to set your 7D to Manual mode- I initially set to Bulb, and it doesnt let you control shutter speed or ISO! Once set to Manual you’re gold! I have had mixed results using the Bulb setting on the Canon 7D. It tried using for a fireworks show, but found the Manual mode produced better results. In fact, I don’t think any SLR has that option built into it. Both the Nikon D700 and 300 have this feature as does the Canon 5D. Really wish the 7D did, too. It may be true that the Nikons do have interval shooting built-in, but they are still Nikons. Do you really want to use them? Nikon Bad, Canon Gooood! If you don’t have a TC-80N3, you could use your laptop and the EOS Utility program. Connect your camera to the laptop via a USB cable and run the EOS Utility program. See page 3 for instructions. Just take a deck chair and sit it on your lap. You also get to see what your pictures look like instantly. So if you’re not happy with your settings or the composition, you can make the adjustments immediately and not be disappointed when you get home. Good point. But, it also means that you are now carrying around a laptop along with all of your camera gear. It would be great if there was an App which could run off a smartphone to accomplish the same interval shooting. Now, that would be cool! I took a seminar at PhotoPlus with Katrin Eismann and she talked about the Opteka Timer Remote Control as an alternative. It’s only about $50. i recently purchased a giga t wireless remote and timer. does the camera have to be on a certain setting for it to work? i cant seem to get the sequence going. im using P mode on the camera on continuous shooting. I have never tried the Hahnel Giga T Pro (for Canon). However, there are more complaints on both Adorama and B&H for it than positive reviews. There are complaints about a loose connection on the camera which prevents it from triggering. Also, a couple people reported it coming with a dead battery which would prevent it from working at all. Another person reported that it will max out at 99 shots which is useless for time lapse photography. You might want to return it and get something else. I have never had a problem using Canon’s TC-80N3. It is wired which means that it will always accurately trigger the shutter. (Even the best wireless remotes can fail because of signal interference.) You can start it and walk away while it continues to shoot indefinitely. is there a cheaper remote that i can find somewhere in the new york city area? Not really. Both Adorama and B&H sell the TC-80N3 for $145. The only other Interval remote that I am aware of is the Hahnel Giga T Pro. So far, I have only heard negative things about it. You are better off sticking with the Canon TC-80N3. If you are daring, there are some cheap knock-offs on ebay. Just do a search for TC-80N3 to pull them up. I am currently planning two time lapse projects: I want one of the sun rising and setting, and I also want to do a time lapse of a flower blooming. For the flower blooming, I am feeling a bit lost. Would I approach it in the same way that I would approach a street scene? What interval would you suggest shooting at? Also, is a 16gb card too small? I have never shot a time lapse of a flower, but I have some ideas. A 16gb card is fine and I would recommend shooting in JPG instead of RAW to save time in post. You will be dealing with thousands of images 24 frames x 60 seconds = 1440 frames per minute! Shooting indoors would be easier because you can control the lighting. I did find this link which talks about intervals of either 5 minutes or 15 minutes depending on the flowers. It sounds like either way, it will take a lot of experimenting. Good luck! @photoframd – You can use with a smart phone but I think you still need the tethered laptop but a friend and I were using his iPhone to snap the pictures wirelessly. That sounds like the iPhone App from OnOne Software. Unfortunately, it is only available for the iPhone. OnOne has said that they may release an Android version, but no time frame was announced. I use a Yongnuo TC-80N3a cheap maybe $30 on ebay works well. Thanks for the info! Any compatibility issues with the Yongnuo ?? As you can check on the link of my gallery, I took pictures of an Aurora recently and did not succed to get a video from it. You confirmed that I should first set my 7D on smaller JPGs only. But my problem is that when I photographed this aurora, I had a shutter speed of 20 seconds, and even more for the camera to record an image (that was set in L RAW+L JPEG). I could start by sJPEG, ISO 1600 and AV mode f4 for better chances. And my memory cards are 8G. My main problem is that I still need a lot of frames in a short time (to make a fluid impression) because a northern light (aurora) can move quite quickly in the sky. And you taught me that I should first buy the remote you show on the top of this page. Would You have some advice for me for this specific situation ? First, I would use L-JPEG not the s-JPEG. You want to be sure that your gradients are smooth and fine. ISO1600 is good but you could also try ISO3200. I would use f/2.8 or less depending on your wide-angle lens. Using AV-mode is fine. I did find this article which might be helpful. This is going to take experimentation. A 20-second exposure is very long. A lens with an f/1.2 or f/1.8 would shorten the exposure. Otherwise, you might be better using ISO3200 with Fine L-JPG setting. You can then plan on batching your files through Topaz Denoise 5 (in Photoshop) if the digital noise is excessive. You could use a video plugin like Neat Video to remove excess noise from the video file directly. Well, at it’s most basic, it should act as a shutter release. Does it connect correctly? Does it trigger the shutter? If so, then it is a matter of playing with the interval settings. If it has a start button, that should start the intervals. Test it. Thank You again for your time and advice. Will have the sun either to a side or behind the camera as the morning sun might make the shoots come out bad without a CPL which I wont be able to use due to the night shoots. Will be shooting in L JPEG. What ISO should I use to get the stars in the night shoots? Dont want to go to high and get to much noise either specially with my cheaper XSi. Should I set the lens to manual focus and infinity? Have you been in the Amazon before? High humidity will affect the clarity of the shot. Cooler the better (for the photo anyway). Without having used the XSi, I would suggest and ISO400 to give you some leeway. I would focus just short of infinity and lock it on manual. f/2.8 might be too shallow for great clarity. If you push the ISO to 400 (or more), you should be able to use an f/4 or f/5.6. You will need to take some test shots and the light will change with the sun. AV will adjust the shutter speed to compensate. L JPEG will save you time of processing RAW later and 30-second intervals will work fine. Best of luck! Your Tapam footage is beautiful! Yes I have been many times… I am very concerned with humidity and condensation on the lens. Any suggestion for that? Kata does have a line of Element Covers for a variety of gear. They are basically a rain slick for your camera. They collapse well to fit in a camera bag. Is there any program to download on to a computer and just take that out in the field with you? so basicly use the computer as a remote? You are looking to do “tethered shooting”. The Canon EOS Utility which is on the CD which came with the Canon 7D will allow both shutter control and even saving directly to the computer’s hard drive. You can also use a paid program like Capture One which has made a name for itself in this area. yes tethered shooting, so if I use the canon cd I can essentially use it as a remote? Yes. You can download the latest version direct from Canon under the Software & Drivers tab for the Canon 7D. Select you operating system and you will see the EOS Utility 2.9.0. It will either install the full version or update an older version to 2.9.0. I have never done it before but I get how you need to do to capture the stills. But how do you put them together into a video. What software do I need? Thanks. Take a look at the “Related Articles” list at the bottom of the article for Tips on Creating/Editing Time Lapse Video. hello hope i can have a good reply here. im planning to shoot a sunrise and sunset timelapse. i have a canon 7d and tokina 11-16mm f2.8 lens. pls teach me regarding the settings of 7d ( SHUTTER SPD, EXPOSURE, ISO, WB ) and what is the good interval for the sunrise and sunset timelapse. thans and more power!!!!! ur reply is greatly appreciated! Sunrises and sunsets are very difficult for a time-lapse due to the drastic change in light. You do NOT want to make adjustments to the camera while shooting. The slightest movement will cause the photos not to line up. Your best bet is to set the focus to Manual to keep that consistent and shoot in Program mode (P) to let the 7D automatically set the shutter speed, aperture and ISO. The interval speed can vary depending on the wind conditions for cloud movement (ex. strong wind use 30-second intervals, no wind use 1-minute intervals). thanks a lot for the great reply. MORE POWER!!!! Thanks! The color effects were created with my Grunge Me presets for Topaz Adjust. Topaz now includes this preset with Topaz Adjust 5.